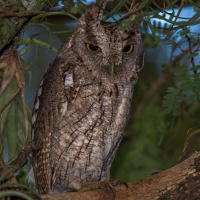 The Pacific Screech Owl is a medium-sized screech owl with prominent barred ear-tufts and yellow eyes. Typical call - Juchitan, Oaxaca, Mexico. March 2000. CC Dan Lane. Description: The facial disc is pale greyish with fine darker vermiculations, while the rim around the disc is narrow and blackish. 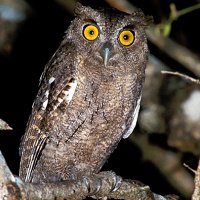 Ear-tufts are fairly prominent, streaked and barred blackish. The feathers of the crown have fine dark shaft-streaks and coarse dark barring. Eyes are yellow, and the rim of the eyelids is brownish-pink. Cere and bill are greenish. Upperparts are relatively pale greyish-brown with dark mottling and streaks. Scapulars have blackish-edged whitish outer webs, forming a white band across the shoulder. Wing coverts are edged whitish, producing a second pale band across the closed wing. Primary flight feathers are prominently barred light and dark, while the secondaries and tail feathers are less distinctly barred. Underparts are slightly paler than upperparts, with thin blackish shaft-streakes and dark vermiculations. Tarsi are feathered to the base of the toes, which are brownish-flesh and covered with stiff bristles. Claws are dark horn with darker tips. 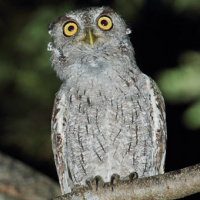 Habits: Little known, likely similar to other Screech Owls. Voice: A series of guttural gruff notes, beginning in a rapid, trilled sequence, followed by accentuated and slower notes, maintaining an evenly spaced staccato to the end - grrurrrr-gogogogogo. This series is repeated an intervals of several seconds and are likely the A-song. 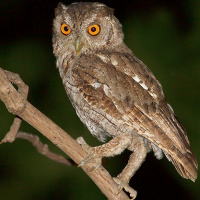 The female's call is similar but higher pitched. The B-song is probably a short series of gruff notes of equal pitch - chochochochocho. A single low, gruff woof is uttered by both sexes and may be a contact call. 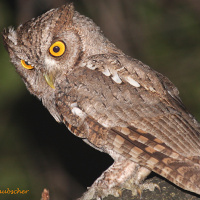 Hunting & Food: The Pacific Screech Owl feeds mainly on insects and other arthropods, and probably small vertebrates. 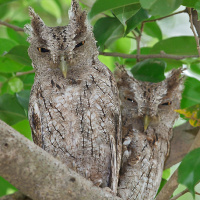 Breeding: Little known, probably similar to other Screech Owls. Nests in tree holes. Habitat: Arid to semi-arid woodland, semi-open landscapes with scattered trees, giant cacti, palms and shrubs. Also swampy forest and mangroves. Lowlands up to 330m elevation. 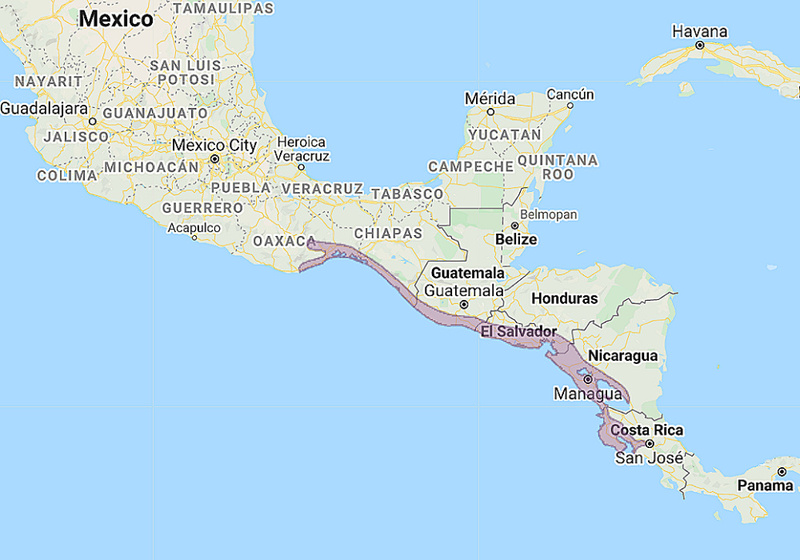 Distribution: Southern Pacific slope of Mexico to Costa Rica. Original Description: Ridgway, Robert. 1878. Proceedings of the U.S. National Museum, 1, p. 116-117.